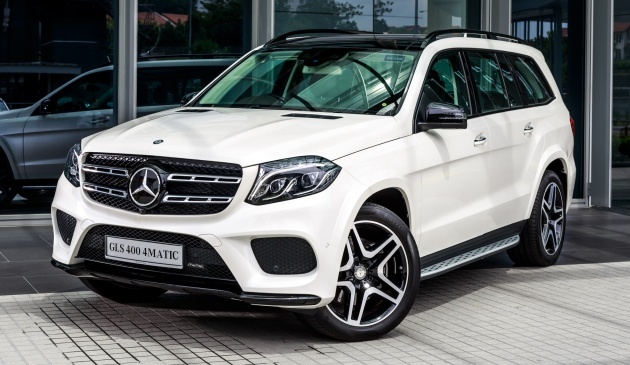 Aside from the G 63 Edition 463 and GLC 250 4Matic Coupe, Mercedes-Benz Malaysia also gave the refreshed GLS its debut, the seven-seater SUV arriving here in a solitary GLS 400 4Matic guise. Previously known as the GL-Class, the facelifted X166 made its world premiere last November, boasting an updated look as well as more power and kit. The exterior rework focuses mainly on the front end, where a new headlamp design, a bolder double-bar radiator grille with a super-sized central three-pointed star as well as a redesigned bumper can be found. The back, meanwhile, gets a new tail lamp design and a tweaked rear bumper. Inside, the fully-imported GLS goes the same route as that taken for the GLE. Revisions include a newly-designed instrument panel, a new three-spoke multi-function steering wheel and a modified centre console with touchpad controller. Also on, a panoramic sunroof, a Comand Online system with an eight-inch colour Media Display and redesigned dashboard function buttons, the design of which is now flatter to offer a more stylish presentation. Elsewhere, the cabin gets new appointment colours, and trim elements can be had in black piano lacquer or a variety of wood finishes. Customers who opt for the optional Exclusive design and equipment line get five interior colour concepts to pick from, these being genuine leather in black, ginger beige/espresso brown, saddle brown/black, crystal grey/black or ginger beige/black. spoke multi-function sports steering wheel in a black nappa leather finish, graduated instrument dials in a chequered flag look and brushed stainless steel sports pedals with rubber studs. 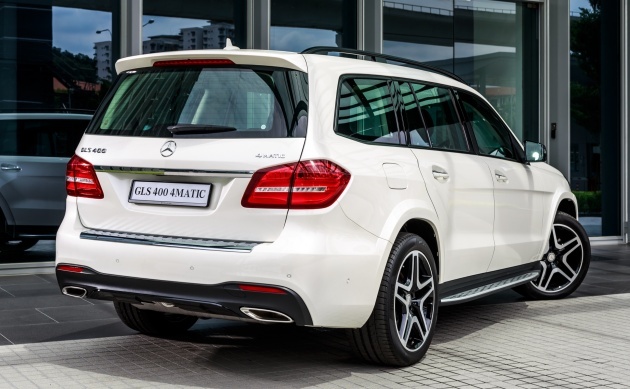 The GLS 400 4Matic features an AMG Line exterior, comprising specific front and rear aprons, side running boards, side flaps painted in the vehicle colour and 21-inch AMG light-alloy wheels. Because it’s very much a special order vehicle, the GLS can be personalised with options, and these include exterior paint finishes, with two special editions in designo diamond white and designo hyacinth red among the shades available for the SUV. Powering the variant is a 3.0 litre twin-turbo V6, with 328 hp at 5,250 to 6,000 rpm and 480 Nm from 1,600 to 4,000 rpm being quoted output numbers. The engine is mated to a 9G-Tronic nine-speed auto ‘box, and performance figures for the permanent all-wheel drive offering includes a 0-100 km/h time of 6.6 seconds and a 240 km/h top whack. As standard, the GLS – which features a Dynamic Select system offering five driving modes (Comfort, Slippery, Sport, Individual and Off-road) – comes equipped with an Airmatic air suspension. The latter has been revised with the facelift, and the damping system has been upgraded to offer better driving dynamics. Buyers can pick an optional Active Curve System, which uses active anti-roll bars on the front and rear axles to reduce body roll under hard cornering. As for driver assistance systems, standard fit items include Collision Prevention Assist Plus and Attention Assist. Pricing for the GLS 400 4Matic begins from RM888,888, on-the-road without insurance. The company says that the GLS 500 and GLS 63 is also available through special order. Lhdm, U can also add GLC Chairman/President/CEO courtesy of Rakyat GST. Just stick wit yr Myvi laa. huhu. if I have a chance to replace my father’s Kia Carnival 2002, i rather choose Volvo XC-90 T8. More economical, less roadtax & lower maintenance except the 20-inch sport rims. 1934mm is good to compete with the waist circumference of Miss Universal. 5120mm is a very huge longer length compared to Q7, I presumed. Shouldn’t flagship model be a bit more generous in dimensions? NOT MANY NEW UNITS CAN SELL UNLESS RECOND AP UNITS IN ANOTHER 2 TO 3 YEARS TIME WHEN PRICES ARE DOWN BY HALF OR MORE. Just cannot accept the tail pipe ..